A few months ago I came across a photo on Twitter showing a barbecue along tram tracks, with a hotplate full of sausages sizzling away on top. So where was the photo taken, and what was the story behind it? The barbecue looked cobbled together, just sitting on top of a small set of rail wheels. The tweet was posted on May 15, and the caption being in French was my first lead. 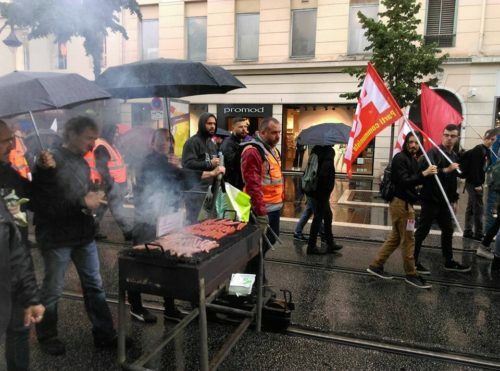 Donc les cheminots ont fabriqué un barbecue roulant adaptable au rails du tramway pendant leur manif. Ils sont très forts. 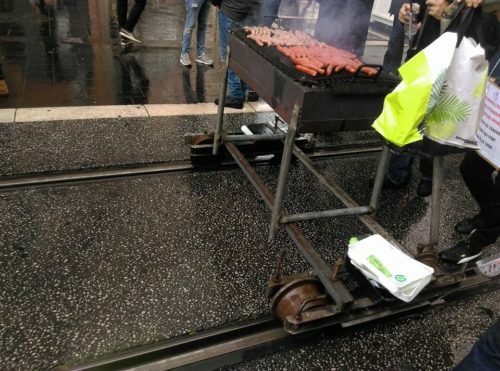 So the rail workers made a rolling barbecue that could be adapted to the tram rails during their protest. They’re very strong. And one of the follow up tweets pinned it down to France. C’est le même écartement entre rails SNCF et tramway, c’est donc un outil détourné !! It is the same distance between rails SNCF and tram, so it is a hijacked tool! Further searching online brought me to a photo posted on Reddit on May 14, showing the same event from a different angle. Mais c’est à Nice ça non? But it’s in Nice, no? Absolument, sur l’avenue Jean Médecin! Absolutely, on Avenue Jean Médecin! With the location pinned down, I headed over to Google Street View, where I soon found the same ‘Promod’ store seen in the background of the original photo. 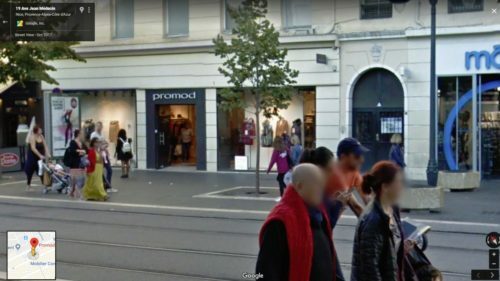 As well as the ‘Bocage’ and ‘Crocs’ stores in the background of the photo posted to Reddit. With the location and date, I was also able to find this news article by the France 3 Provence-Alpes network. Around 800 people, employees of SNCF and workers from other sectors demonstrated Monday in Nice against the reform of the SNCF. The demonstrators blocked a time the entrance of the town hall of the city. Nearly 90% of the staff of the SNCF are on strike Monday in Nice according to the unions. Management also recognizes a particularly difficult day. 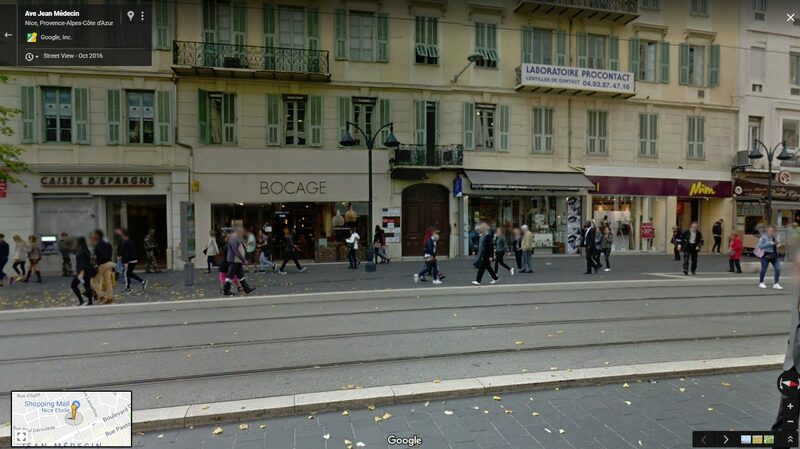 In Nice, a general meeting of the staff of the SNCF took place Monday morning at the initiative of the inter-union near the central station. About 400 people were present to discuss the social movement. 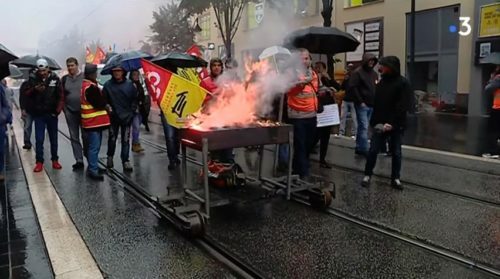 At the end of the general assembly, a procession of 800 people , according to the unions, marched in Nice to demonstrate against the reform of the SNCF. This procession was made up of SNCF staff and other sectors as well as political activists. The protesters left the central station, went up Avenue Jean Médecin, to finish in front of the town hall of Nice as shown in this report by Nathalie Morin and Yannick Fournigault. The network also posted footage of the protest. In which I found the same tramway mounted barbecue that started my search. 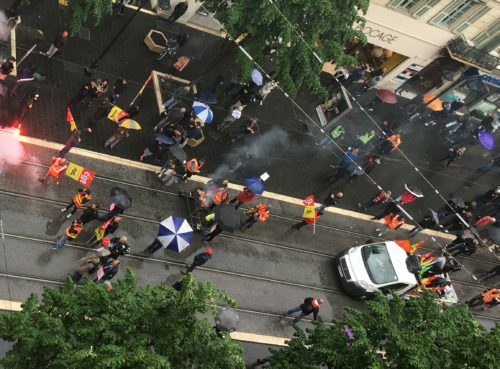 This entry was posted in Trams and tagged food and drink, France, industrial action, mystery, SNCF, strike, tram stops, viral photos. Bookmark the permalink.